Every now and then a company has an idea. An idea so brilliant yet so simple that everyone wonders: how did no one else think of that? Whether it is a correct to a common annoyance or simply streamlining current technologies into greater convenience: sometimes ideas just work. Today I’ll be talking about one such idea. Poker Night 2 from Telltale Games. Yes, a poker game. Don’t switch websites, let me explain. Who out there is a fan of sports video games? Okay next question: are you actually that good at sports? For myself, I was a huge fan of Madden long before I ever played football (and when I did, I was nowhere near as talented as those pixels). Point being: you don’t have to be a professional athlete to enjoy sports games. Indeed that is a huge part of their charm. Does it help to know the game: yes. That’s it though, and even then it’s just a rule set. Gamers figure those out all the time. No it’s not. For all the competitiveness and talent required, poker is a game that anyone can play with a deck of cards. So why am I hocking a poker video game at you? True anyone can play regular poker but Poker Night 2 is a high-stakes poker simulator. I don’t know about you but I don’t have $20,000 of real money to throw down every time I play. 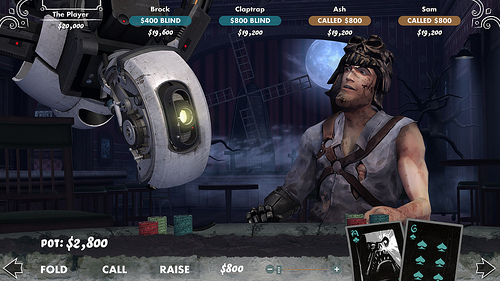 Even if I did, I’m such an addict that I’m glad the dollars in Poker Night 2 aren’t real. Oh, did I mention you play against fantastical characters from your favorite shows, movies and video games? 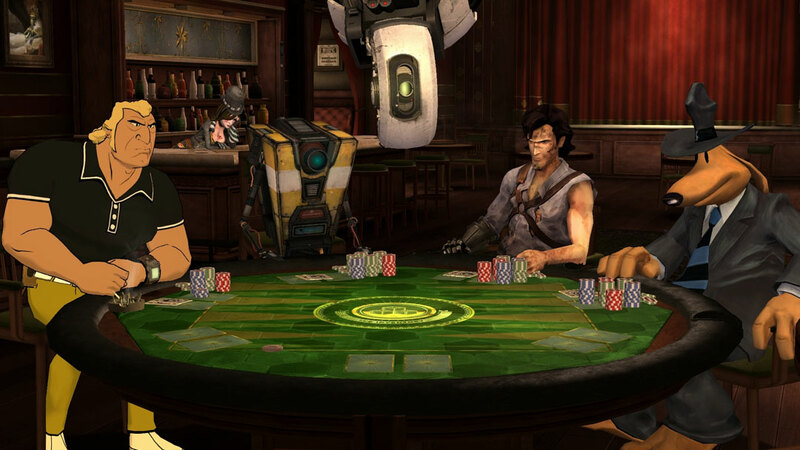 The cast of Telltale’s Poker Night 2. That’s right. 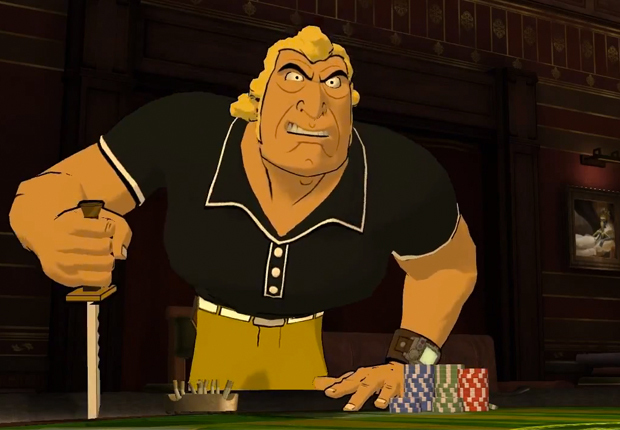 In this game you’ll match poker skills against Brock Sampson (the Venture Bros.), Claptrap (Borderlands), Ashley Williams (Army of Darkness) and Sam (Sam and Max: Freelance Police). Oh and GLaDOS (Portal) is the dealer. Try playing against these people in real life. Rest assured, everyone besides Ash speaks with their correct voice. I should mention that, despite lack of Bruce Campbell (seriously what else did he have to do? ), Danny Webber does an excellent impression and most of the time I couldn’t tell. Anyway, this is a brilliant idea. Who can honestly say they’ve never fantasized about being friends with a fictitious character (Dinobot from Beast Wars and I are besties, if only in my head). While you might not be friends in this game, you’re still playing poker with some awesome people. Is it all make believe: of course. Thank god for that because I’ve gone through $500,000 dollars against these assholes so far. Every character is brought to life with their exact personality from the original source. Telltale should be commended for their effort here. I should say right now that I am not an expert poker player but I have played games before in real life. While you play in a fantastical setting, the game does appear to be a fairly good and realistic poker simulator as well. Again I won’t say that it’s the best (I’m not a tournament player or anything so I don’t know) but it felt like I was playing poker – and that is an accomplishment. Like every good idea, there is room to grow. I don’t know about anybody else but after a few hands, I was already picturing who I would want in the next game. Oh, I should also mention right now that, as of this moment, I have not played the first game, Poker Night at the Inventory, yet but it is a video game that has my interest. 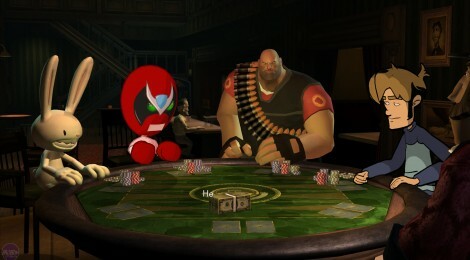 Telltale’s Poker Night at the Inventory, right to left: Max (Sam and Max: Freelance Police), Strong Bad (Homestar Runner), Heavy (Team Fortress 2) and Tycho (Penny Arcade). Maybe this only appeals to geeks, but I can’t wait to see what additional characters come into being in the later installments. I am also rooting for this series to be financially successful enough to warrant said future games (in case you hadn’t picked up on that). Here are just a few ideas for Telltale, if they are listening. I have included my top three for each category (note: feel free to skip the following paragraph, it is pure fanboy wishful thinking). Movies: James Bond (obviously), Agent Phil Coulson (probably the easiest character to get from the Marvel Cinematic Universe), and Indiana Jones (again, obviously). Television shows: Sterling Archer (as good as Brock Sampson was, this guy would be better), Sherlock (Benedict Cumberbatch’s likeness from Sherlock would be wonderful to take money from), and Bender (another obvious choice). 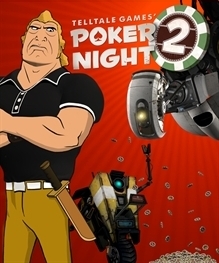 Telltale games (so far each Poker Night has featured at least one character from Telltale): Guybrush Threepwood (the original Captain Jack Sparrow), Bigby Wolf (good way to promote their new Fables game), Gerry Harding (just to give the poor characters from Jurassic Park: the Video Game some redemption). Valve Corporation (each game has also featured at least one character from Valve): Anyone from the Left 4 Dead series… that’s easy. Video games: Jack (really anyone from the Mass Effect Trilogy crew would be awesome – except Jacob. ), Andrew Ryan (cause Bioshock‘s intelligence needs to be taken down a peg), Duke Nukem (he needs to be redeemed as well). And last but not least – misc gaming world celebrities: Yahtzee (http://www.escapistmagazine.com/videos/view/zero-punctuation), Korey (http://spill.hollywood.com/), and the Angry Video Game Nerd (http://cinemassacre.com/). People are already making such crazy dreams a reality – thanks to the wonder of modding. There is a criteria for their selection. Part of the reason why Poker Night 2 works so well is that you believe every one of these characters would actually play poker. During development, Telltale had originally intended to put up someone other than Sam. The first plan was to include either Doc or Marty from Telltale’s Back to the Future video game. Really though – could you see Doc or Marty gambling and drinking? Ouch, right in the childhood. Their next plan was to use someone from their recently released The Walking Dead. God, how horrible would you have felt taking money from one of those poor bastards? The point is: Telltale has a plan for these games. Wonderful gameplay mechanics include unlockables that can change the cards, chips and even whole backgrounds. I only have one idea for improvement going forward. If there is a Poker Night 3, it would be nice to increase the table. Maybe six opponents instead of four? Or a pool of six and four are chosen every time that way conversations are less likely to repeat (it does happen fairly fast, although I’m still hearing new stuff after several hours). Other than that: more unlockables, more challenges and increase the poker simulator (if it even needs it – I don’t know). This is a great idea. Bring together fantastical characters who we admire and enjoy and make us all poker buddies. Well played, Telltale, well played. Available now on Xbox Live, Steam (for Windows users) and the PlayStation Network. Go buy it, you won’t regret the decision.